"How Can We Sing The Lord's Song?" I highly commend this Colloquium on the future of Anglican Catholicism, which will be hosted by St. Vincent's during the first weekend in June. Dr Peter Kreeft of Boston College, the noted Catholic apologist, will be the keynote speaker. And a "Who's Who" of Anglo-Catholic luminaries will be attending and speaking, including Bishops Urwin, Wantland, Parsons, Iker, and Ackerman and the Rev. Dr. Geoffrey Kirk. There will be a Solemn High Mass and two Solemn Evensongs with Benediction, with preachers on each occasion. This is surely a fine investment of $50, which includes your meals. Sign up today! "What we do in life echoes in eternity." That sounds a bit like a quote from Holy Scripture, but many of you will recognize it as a line from a popular film, "Gladiator." This line may not be from the Bible, but I believe it resonates well with this morning's lesson from the Revelation to Saint John. For we see clearly in this reading from Revelation that what we do in life truly does echo in eternity. The white robed army of martyrs around the throne of God St John saw in a vision highlights the enduring effect of our earthly actions. A countless multitude of brave men and women who once faithfully offered the last, full measure of devotion for their Savior and Lord in this life now basks eternally in the glory of God, freed from the discomforts and injuries of this fallen world and swallowed up in bliss. Doubtless many of the holy martyrs that St John envisioned had died with the very same praises on their lips that they now offer in eternity "to our God who sits upon the throne, and to the Lamb." The praises and prayers of the blessed martyrs do in fact echo forever in throne room of God. Of course, it is unlikely that you or I will be tested to the same extreme that the members of that heaven choir have been. In our pluralistic, tolerant nation few now died for their religious beliefs. But sadly this is not true everywhere today. Two weeks ago, for example, three men were bound, beaten and slain by Turkish extremists simply for having the audacity to publish Christian Bibles in a Muslim country. And just a few days ago a prominent Anglican priest in Malawi was found poisoned to death, apparently because of his strong public defense of the Christian standard of fidelity in marriage and chastity in the single state. These examples could be easily multiplied. Almost half the world's population lives in places where it is not safe to practice the Christian faith openly. The threat of arrest, loss of property, beatings at the hands of neighbors and officials, even torture and death, are facts of life for many millions of Christians world-wide. The white-robed army of martyrs still gains new members daily, "from every nation, from all tribes and peoples and tongues." Their blood has become the seed of a vibrant, growing Church in the developing world. No, you and I will probably never be asked to renounce Christ at the point of a gun or be forced to worship in a hidden basement for fear of the secret police. Yet even here it is not always easy to remain a faithful witness to Christ. We have all been places where standing up for "the faith once delivered to the saints" would be seen as "unenlightened" or "uncool" or "impolite." Just try introducing traditional Christian moral standards around a seminar table at one of our elite universities and see what it gets you! At best you will be thought "misguided," at worst "an intolerant bigot." Of course, social disapproval and ostracism are a far cry from martyrdom. If the heavenly chorus of Revelation 7 could remain faithful in the face of the lions and burning crosses of Nero, the mass drownings of Tokugawa Japan, the guillotines of revolutionary France, and the gulags of Stalin, I am pretty sure you and I can withstand the disapproving glances of our relatives and co-workers. If we do stand firm for the faith of Christ, one day the blessed company in glory will make a little room for us to join their great song of praise resounding in eternity. But we can get started right now. We need not wait until the hereafter to gaze upon the Lamb who sits upon the throne and sing His praises. He is here in Spirit right now and will be here in the most tangible of ways in just a few minutes. For it is not only what we do in this life that echoes in eternity, but what they do in eternity that echoes right here today! This entire worship service--what this building and this sanctuary look like, how the altar party is arranged, all of our actions around the altar--are a pale reflection of the throne room of God in the Revelation to St John. We are not all wearing white robes by random chance, after all! When we who are still in this world gather around the altar in the Holy Eucharist we join our voices "with angels, and archangels, and all the company of Heaven" in praise to God our Savior. We shall cluster around this Holy Table as it becomes the throne where the Lamb, who lives even though He has been slain, makes Himself specially present for us as a gift from God the Father through the power of the Holy Spirit, even as He eternally presents His flawless Life back to His Father as an offering for our sin. For the altar is a place where time and eternity intersect, where the commonplace and the sacred meet, and the worship of Heaven becomes the worship of mortals. This is a singular place where time as we know it loses its meaning and the barrier between this world and the next becomes as thin as tissue paper. On this altar the whole of salvation history-all of our Lord's loving acts of deliverance from the dawn of time until the end of days--are brought to a point of radiant intensity and the most precious substance imaginable-the very blood of God-enters time and space. Hence, the very same sacred Blood in which the martyrs "have washed their robes and made them white" will be offered to us for our spiritual drink. It is indeed fitting that we join together with the army of martyrs in worship today. After all, the martyrs are not the only ones "who have come out of the great Tribulation." For the Tribulation our worthy forebearers in faith have escaped is the common lot of the human race. We have all known the effects of the Fall, the inescapable outcome of separation from the Source of Life: pain and loss, sickness and death. We have all endured the temptations and the taunts of the devil and his fallen angels. We have all looked into the Void and sensed its hoplessness. Yet all of us who have repented of our sin and turned to Christ in faith, being buried with our Lord in Holy Baptism and raised to new life in Him through His glorious resurrection, have passed out of that great Tribulation. We, too, have been washed white in the Blood of the Lamb, for salvation belongs to Him and to the One whose Image He perfectly reflects. We are sheep who know the voice of the Shepherd who stands in our midst here today. We have drunk from the springs of living water to which He leads us, and we shall never perish. Therefore a place is reserved for us "before the throne of God,” where we will “serve him day and night within his temple; and he who sits upon the throne will shelter [us] with his presence" as our praises echo in eternity: "Blessing and glory and wisdom and thanksgiving and honor and power and might be to our God forever and ever! Amen." ... when they say in Star Wars, "May the Force be with you," and you respond, "And also with you." This and other mildly amusing observations (what other kind of amusements would Episcopalians want?) at Stand Firm. Episcopalians believe their rectors will visit them in the hospital, even if they don't notify them that they are there. Episcopalians usually follow the official liturgy and feel it is their way of suffering for their sins. I will be an instructor in Holy Scripture at St. Michael's Youth Conference Southwest (sometimes called an "Anglo-Catholic bootcamp") this June 24th - 30th. It is now time to enroll. I urge all readers with teenage children to consider sending their kids to this fine event. All of the instructors are clergy of Fort Worth and Dallas this year, I believe. Much more than a ‘Church Camp’, St. Michael’s Conference is a 7-day conference where an intentional community of prayer, support, and education helps to form young Christians to be witnesses to the world of the Saving Power of Jesus Christ. Through worship, study, discussion, recreation, and relaxation, the community seeks both a clearer vision of God in Christ, and strength and power to fight evil and serve God. For most, it is such a joyful experience that they want it to continue, and many do continue by returning year after year. Michael is a good patron Saint. He symbolizes a strong religion, the kind of religion where true joy is to be found. This conference has already borne much fruit in the life of the Church through the lives of those Michaelites (Conference participants) who are active in their respective parishes. We are committed to making the Conference available to the youth of the Southwestern region of the United States. For members of St. Vincent’s Cathedral parish, scholarship assistance is available to help make this possible. Our intention is not to do a “new” thing, but to faithfully hand on what has beengiven to us - the Catholic Faith of the universal Church. Our worship and practice are therefore unapologetically Anglo-Catholic, and our teaching orthodox. To register, please go to the website http://www.stmichaelsw.org/ and follow the directions on the front page. The cost is $300.00 and you will need to send in a $100 deposit with your registration form. The balance of $200 will be due when you arrive at Camp Crucis for the Conference. Scholarships are available for those who need financial assistance. St. Michael the Archangel, defend us in the day of battle; be our safeguard against the wickedness and snares of the devil. May God rebuke him, we humbly pray; and do thou, Prince of the heavenly host, by the power of God, thrust down to hell Satan and all wicked spirits, who wander through the world for the ruin of souls. Amen. [Archbishop Williams] also told Anglican divinity students at the University of Toronto in a closed meeting that he found unacceptable a draft covenant presented to the senior archbishops, or primates, that would allow the communion to boot out member churches deemed to have stepped out of line doctrinally on issues such as sexuality. Such a move would be a first in Anglicanism's 400-year-old history. But he rejected a suggestion made earlier by the Canadian primate, Archbishop Andrew Hutchison, that he defer next year's world gathering of Anglican bishops -- the decennial Lambeth Conference -- at which differences will be underscored between the liberal wings of Anglicanism and the more conservative churches in the Southern Hemisphere. Andy Bartus, our youth minister at St. Vincent's Cathedral, has posted a fine series of short videos he took during celebration of the Great Vigil last weekend. These may be found here, and I commend them for your viewing. Bishop Iker's fine sermon at the Easter Vigil is also available on-line. My father took this fine picture of our cathedral today, featuring the new bells in the campanile. We were able to use the bells to their fullest this Holy Week, including ringing the Angelus before the clergy entered for the Chrism Mass on Tuesday. But the highlight of bell use was on Good Friday, when the largest bell tolled thirty-three times as the altar party existed the sanctuary and nave of the church in what was otherwise silence. It was a very moving experience. May the risen Christ reign in all of our hearts. Happy Pascha! “He was wounded for our transgressions, he was bruised for our iniquities; upon him was the chastisement that made us whole, and with his stripes we are healed.” From the Book of the prophet Isaiah, in the name of the Father and of the Son and of the Holy Spirit. Amen. 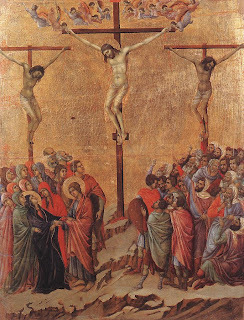 The veneration of Christ’s Cross with a kiss is one of the oldest and most wide-spread devotions in the Christian Church. We share it with the communion of saints throughout all ages. And yet there are millions of sincere Christians today who would be uncomfortable with our veneration of the Holy Cross tonight. Indeed, some people here now may question why we are about to kneel before a piece of wood and reverently kiss it. After all, God did command Moses on the Holy Mountain, “You shall not make for yourself a carved image […]. You shall not bow down to them or serve them.” Can we be sure that our special act of devotion to the Cross of Christ tonight is appropriate? You see, “materiality” and salvation are intimately linked. The Christian faith is not just about “ideas.” For, my brothers and sisters, the pagans have their mythology. Philosophers and scientist have their theories. But you and I, as the people of God, have the facts of history. Our faith relates entirely to the real world and the God who made. For the one true God, whom we worship, is not an abstraction. He is the Maker of all that is, visible and invisible. 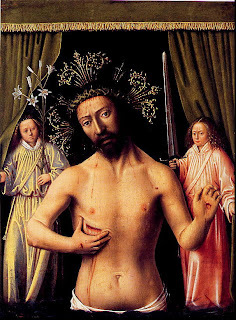 The Lamb of God, who gave Himself up for us on this terrible, yet “Good” Friday, is not a “redeemer myth” or “literary trope.” The flesh and blood man, Jesus of Nazareth—very God of very God come down from Heaven, saved us by the most mundane things imaginable: bone-studded leather whips, the spittle of Roman executioners, eight-inch long iron spikes, and a couple of rough-hewn pieces of wood. And from that despicable assemblage of material stuff, at one particular place and one particular time—outside the walls of a mid-sized town in a remote province at three o’clock on a Friday afternoon—our Lord Jesus Christ crushed the power of sin and death and gave birth to a new creation. For that day at the Place of the Skull God Incarnate took upon Himself every sin committed by the human race--from that last dawn in Eden until the End of Days--as “He stretched out His arms of love on the hard wood of the cross.” All the suffering that sin has inflicted upon mankind since the Fall--every broken heart, every ache and pain, every tear shed at every graveside—our Lord Jesus offered all of them up in His own flesh as His perfect, atoning sacrifice to God the Father. Because Christ was lifted up on that rough-hewn Roman cross, there is no pain we can suffer that our God has not already shared and there is no trespass we may commit beyond the forgiveness of the One who knew no sin, yet became sin for us. And as those two unobtrusive pieces of Roman wood soaked in our Savior’s precious Blood, they became the Tree of Life for all those who have repented of their sin, placed their trust in Christ, and been buried with Him in the waters of baptism. This is most certainly not Bulfinch’s Mythology. The handful of Christ’s disciples who watched their Master die on Golgotha knew that His suffering and death were material facts. That evening they pulled the spikes out of wood and tortured human Flesh. They washed the clotted blood from our Lord’s wounds, hurriedly wrapped His stiffening corpse in a shroud, and laid it on a stone slab in a borrowed tomb. None of this took place in the fantasy land of the pagan myths. There are golden apples, no flying horses, no nymphs and fairies. Just iron, wood, stone … and death. This all happened in the world of space and time that you and I inhabit. It happened in our world because the sin that separates us from God takes place here. The instruments of our redemption—whips and thorns, spikes and cross, blood and water flowing from a wounded side—were made of ordinary matter because you and I suffer and die in a world made of the very same “stuff”. 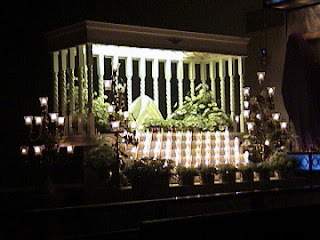 The image above is of the Altar of Repose in St. Mary's Chapel at St. Vincent's Cathedral in Bedford, Texas (photo by R.D. Foster). 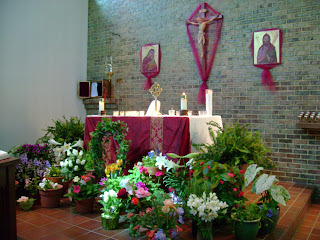 The photo above is of the Altar of Repose at St. Timothy's Church in Fort Worth, a parish famed for the beauty of its worship and the devotion of its parishioners (photo courtesy of Fr. Christopher Stainbrook, SSC). Our reading tonight from St. Paul’s first letter to the Corinthians is one of my favorite passages of Scripture. This might surprise you a bit, as St. Paul’s dismissal of “the wisdom of the world” is sometimes thought to be “anti-intellectual.” And as many of you know, I have spent a fair amount of time in school. (My parents are sitting there thinking “That’s an understatement!”) Most of my adult life has been spent in the company of the “wise men” and “scribes” of a dozen colleges and universities. And when I hear “the debaters of this age” dismissed by the blessed apostle tonight I instantly think of my days as a lawyer in west Texas. So perhaps you can understand why tonight’s epistle lesson seems to have been written just for me! I know the wise men, scribes and debaters of this age pretty well, and frankly, they could stand "a good talking to"! But when Redemption finally did come it flew in the face of this “common sense.” We should admit it: it is difficult to think of a more “contradictory,” “illogical” and “wrong-headed” plan for salvation than the one God sprang upon the world two thousand years ago in Palestine. The all-powerful Lord of the Universe came to us as the weakest of things, a newborn babe in a manger. The Eternal One entered into time and passed His days just as you and I do: eating, drinking, sleeping, laughing with his friends or sitting alone being bored. And try this one on for size: the God who knows the position of every atom in the cosmos wound up being home-schooled by His mother, a Jewish peasant girl from Galilee! Can you imagine God-on-earth learning to sing “the alphabet song” or doing His math homework? Now that is just weird. You call that a respectable religion? It’s preposterous. Of course, the contradictions of the Gospel crescendo during Holy Week. For in the coming days the God-man will wash the feet of His friends as if He was the basest of slaves. The Master of the banquet will serve His friends His own flesh and blood for dinner. And the One whose divine finger wrote the Law of God on tablets of stone on Mt Sinai will be condemned to death as a blasphemer of that same Holy Law. That is simply absurd, is it not? On Friday the King who was hailed by the multitudes last Sunday as He entered His city in triumph will be condemned to death by those very same voices and he will receive his royal crown and purple robes at the hands of Roman specialists in torture and humiliation. And then Love Incarnate will mount His cross and take all the pain and grief and loss the world has ever known or will ever know into His own soul and carry that wretched lot into Hell where they belong. And so the Lord of Life will die to set us free from sin and death. We cannot do this Truth justice, and yet we must try to speak. If we did not, the very stones themselves would cry out the glories of so great a salvation. So we come here to praise our Father God in the Great Thanksgiving, telling of His love and mercy as our feeble wisdom gives us skill. Then let us offer up ourselves, our souls and bodies, in gratitude for the most precious gift of His Son, “Christ the power of God and the wisdom of God.” May the wise men, scribes and debaters of this age remain silent, and learn with us from Christ, the wisdom of God. Amen. ALMIGHTY and everlasting God, who, of thy tender love towards mankind, hast sent thy Son, our Savior Jesus Christ, to take upon him our flesh, and to suffer death upon the cross, that all mankind should follow the example of his great humility; Mercifully grant, that we may both follow the example of his patience, and also be made partakers of his resurrection; through the same Jesus Christ our Lord. Amen. Maundy Thursday services will be begin at 7:30PM, as will the Good Friday service (which includes the veneration of the cross and the Mass of the Pre-Sanctified). The Great Vigil of Easter begins on Saturday night at 8PM, when Bishop Iker will be the preacher and celebrant. 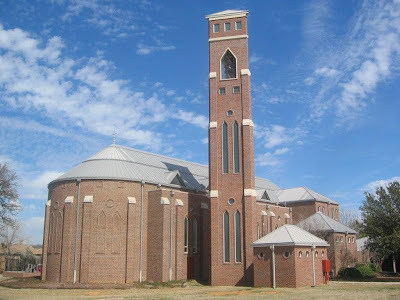 The cathedral is located three blocks south of Airport Freeway on Forest Ridge. These photos were taken this morning by my father, R.D. Foster. 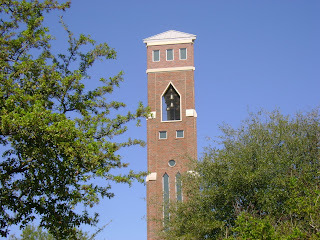 At left you will see an excellent picture of our new bells, which grace the largest bell tower in the area. They have become fully operational just in time for the joyful noise of the Easter to come!